Editor's Note: On the eighth anniversary of the 9/11 attacks, Friday’s American Morning audience appeared cynical and skeptical about the country’s ability to unite as it did on that tragic day. Most faulted the “divisive” media, greed, and racism as barriers to unification. Anthony: The division we have is severe, you will see this country break up, like the USSR, no one thought the Soviet Union would implode. We’re next. John: It is shameful and embarrassing that American's can not come together to resolve the nation’s issue. Churches need to step up to the plate take more of a leadership role in our communities, instead of preaching hate and pushing political agendas of their own, that divide people. Stacee: America will never come together because of the greed and the racism of the wealthy people as you can see Congress don't ever have respect for the President of the USA and the white people in this country want the rich to stay rich and the poor stay poor just remember Katrina in New Orleans that is what this country is built on and it will never change sad to say but it is true. Do you believe the country can unite as it did on 9/11/01? What do you believe are the barriers to this unification? How can we again bring that cohesiveness to our nation and keep? Eight years ago today the United States was attacked in what was the worst terrorist attack in the nation's history. Since that day America's leaders have been warning the country that an attack on U.S. soil is imminent. In January 2002, during President Bush's first State of the Union address, he said "Thousands of dangerous killers, schooled in the methods of murder, often supported by outlaw regimes, are now spread throughout the world like ticking time bombs, set to go off without warning." Vice President Cheney followed the president's warning a few months later in May saying, "I think that the prospects of a future attack on the U.S. are almost a certainty. It could happen tomorrow, it could happen next week, it could happen next year, but they will keep trying." America watched nervously, anticipating the worst but no attack came. Since that sunny September morning 8 years ago the United States has been able to stay safe – but how? (CNN) - Two employees at the Baltimore, Maryland, branch of the liberal community organizing group ACORN were caught on tape allegedly offering advice to a pair posing as a pimp and prostitute on setting up a prostitution ring and evading the IRS. The video footage - which has been edited and goes to black in some areas - was recorded and posted online Thursday by James O'Keefe, a conservative activist. He was joined on the video by another conservative, Hannah Giles, who posed as the prostitute in the filmmakers' undercover sting. "Stop saying prostitution," the woman, identified by the filmmaker as an ACORN tax expert, tells Giles. The other woman tells them, "You want to keep them clean ... make sure they go to school." WASHINGTON (CNN) - The GOP congressman from South Carolina who shouted out during President Obama's health care address to Congress insisted Thursday that his outburst was "spontaneous." 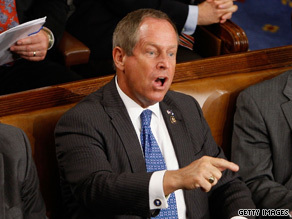 Rep. Joe Wilson shouts, ''You lie!'' after President Obama denies the health plan would cover illegal immigrants. He was referring to two amendments on one version of proposed health care legislation, which he said would have provided for verification of citizenship. Both of the amendments were defeated, he said. Fact check: Will plan cover illegal immigrants? What happened to national unity? Remember how 9/11 drew us together as a country? We were unified – we would do anything for one another. 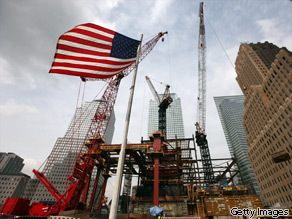 An American flag flies in front of the construction site of the former World Trade Center site on September 8, 2009. Now there's shouting, name-calling and even a congressman calling the president a liar. It's not that we've forgotten what happened on that day. The lingering pain makes that impossible for many of us. But some visiting the 9/11 Tribute Center memorial in New York this week wondered if we remember enough. “This was a terrible time in our lives and we need to step back and remember and teach everyone what we saw,” says visitor Charlotte Harris. Not just the pain, but what we shared. “From 9/11 it was everybody together and this health care thing has got everybody tore apart,” said Connie Shrock. It leads us to wonder: Is unity still possible? It has had a chilling effect on compromise and civility: if you don't agree with me – you're unpatriotic. Drew Westen, a psychology professor and Obama supporter, says the president, as the nation's moral authority, needs to step up. For those committed to seeking common ground, the two dominant political parties are the source of much divisiveness. “The way the political process is structured relies on the society being fragmented and disunified,” says independent political activist Jackie Salit, president of independentvoting.org. Although the intense patriotism felt by many after 9/11 may have receded, Salit says the key is for people to recognize their shared goals. “When people create together, one's ideological differences don't matter as much." What do you think? Is national unity still possible?